A Lego model of ‘the Pillar’ is on display in the GPO as part of a recreation of the post office during the 1916 Rising. A 50,000 piece lego sculpture of the GPO, Nelon's Pillar and O'Connell St on display at the GPO. YOU THOUGHT IT was gone forever, but Nelson’s Pillar is returning to O’Connell Street – after being rebuilt in Lego. After dominating the Dublin skyline for over 150 years, the monument was infamously blown up in 1966, the 50th anniversary of the 1916 Rising. Nelson’s Pillar was completed in 1809, to commemorate Lord Nelson’s famous victory over Napoleon’s fleet at the Battle of Trafalgar four years before. Now, a model of ‘the Pillar’ has been built, to form part of a Lego recreation of the 1916 Rising. The model, which comprises 50,000 pieces, carefully built over two years by Paul Derrick, from Co Monaghan, has gone on display in the GPO. “Paul Derrick spent two years designing the model and sourcing Lego pieces from all over the world and it’s truly a work of art,” said Anna McHugh of An Post. To see so many customers and visitors of all ages and nationalities enthralled by the scale and detail of the 50,000 piece model is wonderful, in this special year. 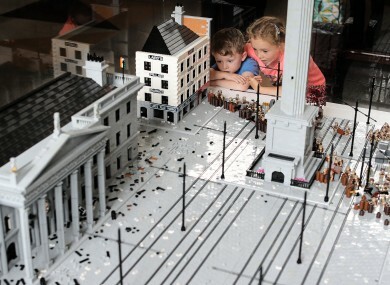 The Lego GPO – complete with pillar, trams, troops and neighbouring buildings – is a dramatic representation of the scene around the centre of Dublin at the height of the 1916 Rising. Soldiers, policemen, rebels – including a wounded James Connolly – and the blazing post office all feature in miniature detail in the exhibit, part the new GPO Witness History visitor centre. Twin nine-year-old brothers Allan and Peter Berry from Portmarnock enjoy the display. “We did a school project about the GPO so it’s great to see this and be in the real GPO,” she said. We felt the dancefloor shaking but it didn’t stop us dancing. A bird's eye view of the Lego model. The Battle of Trafalgar ended the threat of a French invasion of Irish and British shores, and effectively restricted Napoleonic expansion to mainland Europe. Up to a third of the sailors involved in the cataclysmic naval engagement were Irish. Visitors were able to climb 168 steps inside it to a viewing platform just beneath the statue of Horatio Nelson. Complete with its statue of Horatio Nelson, the edifice rose to a height of 40.8m (134ft). Although Nelson’s Pillar was popular among tourists, for the next 157 years it was known merely as ‘the Pillar’ – until it was unceremoniously blown up by a republican splinter group in March 1966. It was completely demolished days later by the Irish Army, and replaced by the Spire in 2003. Senator Kevin Humphreys of Labour recently called on Dublin City Council restore the pillar’s entrance gates, currently located at the Ringsend sewage pumping station. Email “After 50 years, Nelson's Pillar is returning to O'Connell Street - in a slightly different format”. Feedback on “After 50 years, Nelson's Pillar is returning to O'Connell Street - in a slightly different format”.